Welcome to Fish Window Cleaning Miami! Contact us today at (305) 599-8421 for a free on-site estimate! Do you ever wonder if companies really care about your satisfaction? When you choose Fish Window Cleaning, there will be no question as to whether or not we want you to be happy! That's because we are committed to your satisfaction. Our team has been professionally trained to provide top-notch service every single day. We know you're busy and it's hard to take care of your family, your job, and keep your home looking great. Let us help by maintaining the appearance of your windows, gutters, chandeliers, and much more! Whether you need your home cleaned for the holidays, spring cleaning, or just as regular maintenance, we're ready to help make your home sparkle! Our team is friendly and trustworthy. We even introduce our team to you before we begin cleaning so you know exactly who is in and around your home. Click here for more information on our services for your home. We know that you always want your customers to be happy and we feel the same way! We understand how important our customers are so we work hard to make sure your experience with Fish Window Cleaning is hassle-free and 100% positive. Our team is licensed, bonded, and insured for your protection and the protection of our window cleaners. We even wear uniforms because we know that the company you hire will reflect on how your customers perceive your business. Click here for more information on our services for your business. 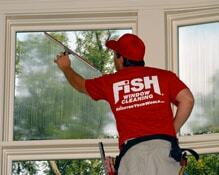 When you choose Fish Window Cleaning, we are committed to your satisfaction. Our window cleaners are trained to provide only the best customer service you have come to expect in the workplace or the quiet environment of your home. Window cleaning is our profession. It's not just a job we do, and we treat it that way. Call us at (305) 599-8421 to schedule a free on-site estimate! We would be happy to add you to our growing list of satisfied home and business owners.